A great beginners/kids project as no tools are required. 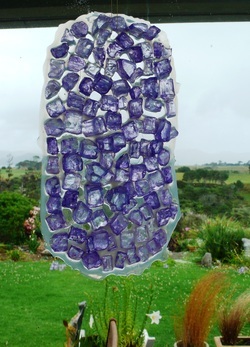 I used glass nuggets purchased from a garden centre. These can also be found at $2 Shops. Spread PVA onto the plastic lid – use just enough to ensure the beads or glass tiles stick. If you use too much the glue will take days to dry. Place the glass nuggets into the glue - I have only used one colour but let the kids choose as many colours as they wish. For Littlies sorting the colours into groups before you begin is a great fine motor skill activity. There will be some natural spaces that are ideal for creating a hole so you can thread some fishing line through to hang. Hang in a window to let the light shine through or hang outside and let it dance in the wind. If you would like to download these instructions click below.